As Christmas is fast approaching and many of us intend to embark on frantic journeys across the country to visit loved ones, it seemed only right we include an app that allows users to book hotels and last-minute accommodation from their mobile phones. The app from Hotels.com is a handy way to book hotels on the go, whether you want to stay over somewhere between visits or just escape from annoying extended family for a night. The app contains more than 140,000 hotels worldwide, so you’re bound to find something fairly close to where you want to stay. The app can either work with your current location, or you can enter a city if you’re not at your destination quite yet. It’s not just about finding accommodation either, if you’ve already made reservations you can control everything from within the app too, so all your details are safe and stored, which is ideal if you’re travelling without a laptop. 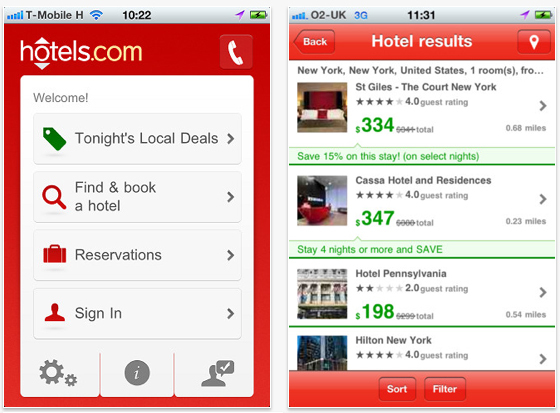 The thing we like most about the Hotels.com app is that it isn’t just full of normal accommodation and pricing details, but it’s got sections for customer reviews, photos and plenty of extra details about the hotels too, so even though you may be in a rush you can make the most informed decision. There are also rewards and deals sections available exclusively to mobile users, so regardless of whether it’s Christmas or not, if you travel regularly throughout the year it’d be worth getting the app so you don’t miss out on any offers. Available for free from iTunes and the Android Market.